From shaky vocals in the national final to a very theatrical performance here in Lisbon. A performance that you’ll either like or think is over the top. Take a look in our gallery or watch our Complete the sentence video interview. 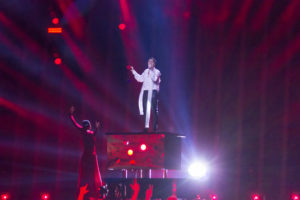 Belarus is competing in the first semi-final as song number 8. 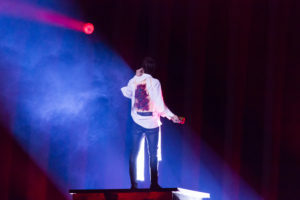 The country is represented by Ukrainian singer Alekseev and the song Forever written by Kyrylo Pavlov and Evhen Matyushenko. 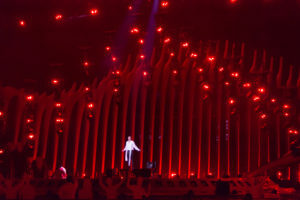 Pedro, Portugal (in the presse center) – I had hopes Belarus would do something different as I wasn’t a big fan of their original concept but they didn’t. Everything is still the same and it may actually help them qualify as people will obviously remember the rose and all the dramatism of the performance and, after all, the song is good. Vocally, Alekseev is still shaky and seems a bit nervous, we can only hope he will pull it off during the live shows. 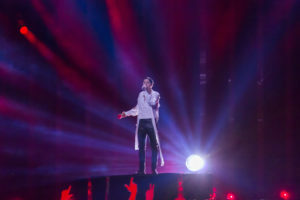 Michael, United Kingdom (in the arena) – The staging of this is terrific as so often happens with Belarus, and to watch it fascinates. Alekseev was very nervous, you can really see him shaking, and it’s obvious his singing is not the best. It’s his charm that wins the day, and that may be enough to take it to the final,, but it’s one of the borderlines. Well… Be prepared for some big surprises during this performance. And don’t read further, if you don’t want to know. Spoilers ahead. 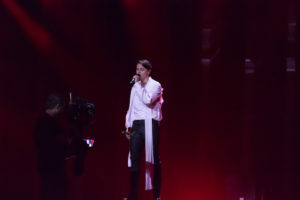 The performance starts very sad with Alekseev singing his heart out to a red rose. The rose is then placed just in front of the camera and it follows the picture and spins around for a while. It all end in a big red-light explosion. The rose has now transformed itself into a dancing lady in red. The lady then takes a shot at Alekseev – with a bow using the rose as an arrow. 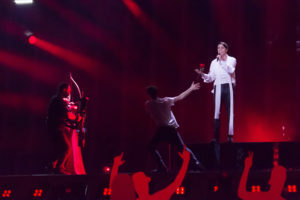 Alekseev is deeply hurt, as the rose comes through his bleeding hand. It all explodes once again. This time in a big inferno of rose petals. 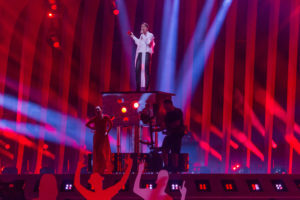 The lady in red keeps dancing, while Alekseev is lifted up in the air by a stage lift. At the end of the song he turns around and you realize that his back is bleeding and hurt by dozens of red roses. All in all a very theatrical and emotional performance. The big question until now has been how is Alekseev’s vocal? But we still don’t really know because all our attention during the song was on the red rose. Even if you don’t understand a word Alekseev is singing you get the feeling it’s about love story with a very sad ending. 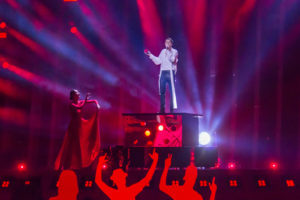 The broadcaster in Belarus received 95 potential entries for their national final. 11 of them were selected – and then the controversy started. 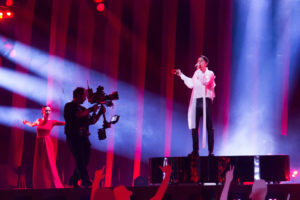 Alekseev’s song had been performed publicly before the 1st of September deadline set by both the EBU and the broadcaster. 7 of the 11 participants openly complained about that he was able to take part despite the break of rules. One act even withdrew from the national final in protest. 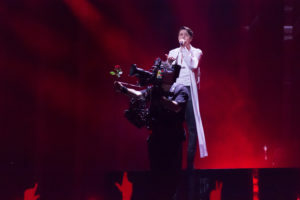 Both EBU and the broadcaster approved of Alekseev’s entry as it was seen to have had an advantage from this breach of rules. 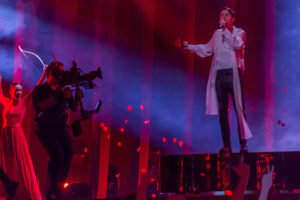 So, on the 16th of February, the Belarussian national final took place – and with Alekseev winning both jury and televoting, he is representing the country this year. Some countries aren’t particular faithful in their first years of appearance if they get off to a bad start. With Belarus it is not like that. The country debuted in 2004 and they have taken part every year since despite some shaky results. The first three years, Belarus didn’t manage to qualify for the final. They had to wait until 2007 where Dmitry Koldun sang Work Your Magic. Not only did he make it to the final, he also finished 6th, which to date is the best result the country ever achieved. 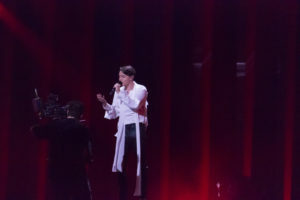 With 14 participations and only five times in the final, Belarus has had some problems finding a steady steam of qualifying entries.